Amazon has finally managed to pin record labels down to deals that allow it to offer a scan and match track service like that of iTunes Match and Sony Music Unlimited. Sony Music, EMI, Universal, Warner and over 150 independent companies have all signed on the dotted line to allow Cloud Player customers to scan their hard drives and make all their music available to stream from the cloud, rather than having to arduously upload it all themselves. 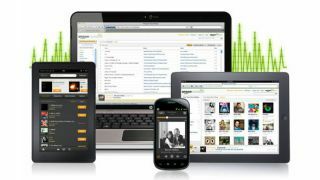 Amazon MP3 purchases will now be automatically saved to the cloud locker, and all scanned-and-matched music from iTunes or Windows Media Player will be made available at 256 Kbps, regardless of the quality of the file you own. There are also a couple of bits of new hardware on the horizon, with Amazon quietly adding that Sonos and Roku systems will soon be Cloud Player compatible. The wireless systems join iOS, Android and the Kindle Fire as Cloud Player friendly products – you can also access your library through any old web browser. Although you can sign up to Cloud Player for free, that will only give you 250-songs worth of storage; paying an annual fee of $24.99 (around £15 although it hasn't officially launched in the UK) will nab you 1,000 times that (that's 250,000 songs, maths-phobics). Hopefully the leaps forward in licensing deals will see an official Amazon Cloud Player launch hit the UK - maybe at the same time that the Kindle Fire finally lands on British shores, eh Amazon?